No, That’s not a typo. Prebiotic foods help create a cozy home for those essential gut health helpers we’re always talking about – probiotics. We know you’ve heard all about probiotics, as probiotics can help with gut health, clear skin, healthy brain function and can keep your immunity strong and well. I’d love to introduce you to prebiotics! Prebiotics are plant fibers that feed your good bacteria (think food for bacteria), and they are essential to your body’s health and wellness. Prebiotics help your good bacteria to flourish. It’s important to have a healthy balance of good bacteria in your beautiful body, and to make sure you are getting both pre and pro-bacteria along with your daily vitamins and protein. favorite prebiotic foods include: oats, bananas, dandelion greens, asparagus, flax seeds, chia seeds, edamame, avocado, raw garlic and onion. Just as it’s important to focus on your health and daily meals, it’s essential to get a healthy serving of prebiotic foods on your plate every day to feed your probiotics and continue to keep them strong! I’ve selected a few of my favorite prebiotic recipes for you to try. Delish! 2 Tbsp unsweetened almond butter, natural (optional) for protein! In a medium saucepan, boil the water and coconut milk beverage or almond milk. When it boils, pour in oatmeal, reduce heat to a light simmer and add ¼ teaspoon sea salt. Cook for approximately 20 minutes or until a porridge-like consistency forms. When the oatmeal is all cooked through, pour into two bowls. Top with almond butter (if using), yogurt and honey or maple syrup. Take your Instagram photo and then mix it all to eat! Top each bowl with your choice of mixed berries and almond/coconut milk, if desired. Sprinkle with some flax-seed meal. 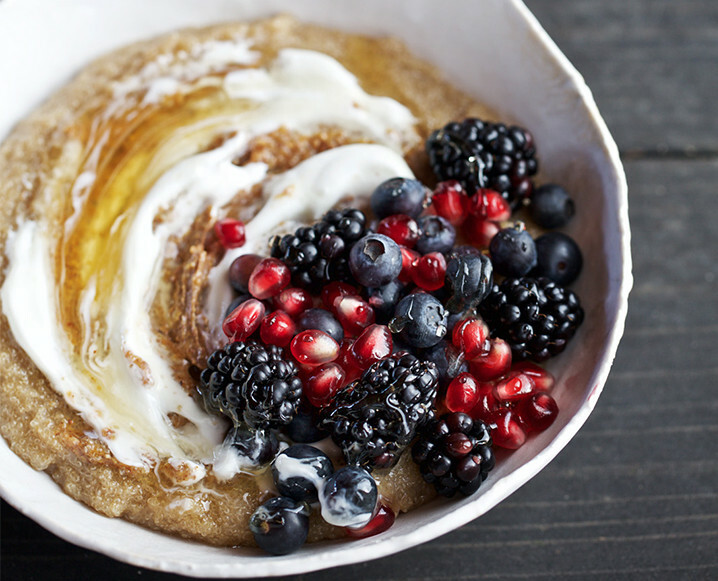 Enjoy for a delicious fiber- and protein-filled power breakfast this weekend! Finely dice onion and cilantro. Place the avocados in a medium bowl. Using a fork, smash and stir the avocado, breaking it up into a chunky mass, leaving some avocado bits whole. Add the lime juice, Greek yogurt and tamari and stir to combine. Top with wild arugula or cilantro, if using (you can even add those dandelion greens to get even more prebiotics!). Taste with a chip, and add more salt if needed. Serve up the party immediately! Yass! And share this recipe with a friend! Share the post "Why Prebiotic Foods Matter Just As Much As Probiotics"
Very valuable information. Scanning shows that the right environment in the gut hosts infinitely more good bacteria than regular consumption of probiotics supplements. Good old porridge is a great start, and I have found psyllium husks to be excellent also.